coffee & coconut cream ice cubes. iced coffee season is upon us! i know that a lot of people prefer to drink iced coffee drinks year-round, soo.. even better!! here are some fabulous little flavorful ice cubes - made with brewed coffee and coconut cream - that will keep your iced coffees and cold brews from getting watered down. and they add some flava & sweetness. i don't like getting half way through an iced coffee and having it taste like h2o + a light residual trace of coffee. i just want da coffee! so i made these coffee ice cubes. for my coffees. coffee coffee coffee. i reeeally like coffee + coconut flavors, so i made these ones with coconut cream and coconut extract. if you're not a coconut fan, you could use a different kind of milk or cream that you like and perhaps vanilla extract or some sort of caramel flavoring or whatever floats your personal iced coffee boat. this is super easy and requires just 4 ingredients and a good amount of time in the freezer. i froze these cubes for a full 24 hours before taking them out of the tray. the results were just what i wanted - extra coffee flavor + creamy coconut flavor + a hint of sweetness. 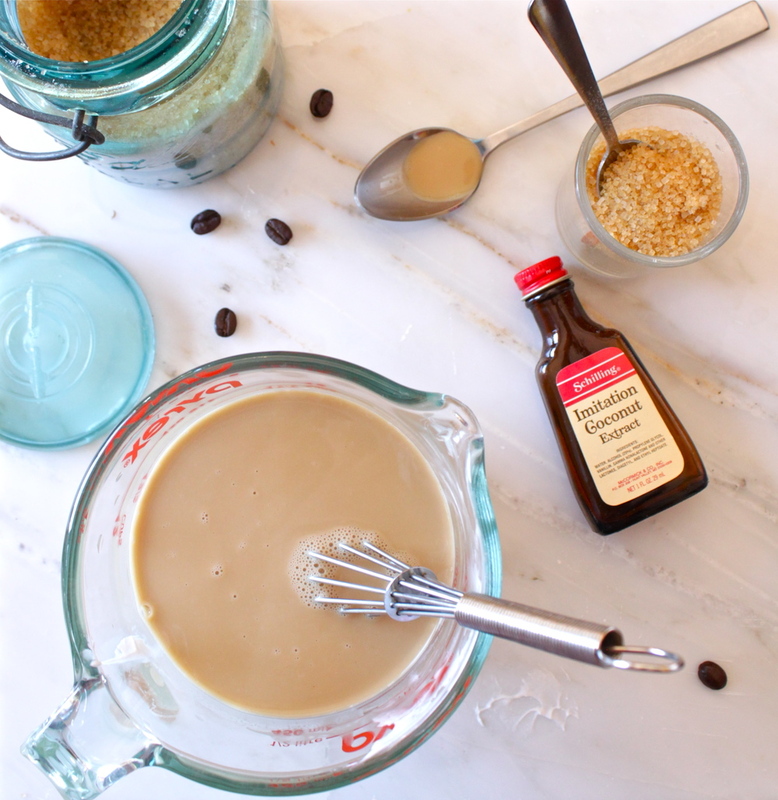 you could totally use multiply this same recipe to make coffee coconut cream popsicles! i wish that i had frozen half popsicle sticks into some of these cubes, because i ended up just eating the last few cubes on their own :) they're tasty and refreshing. *i would use agave nectar instead of raw sugar if you prefer a "more natural" sweetener - although i'm not entirely sure how natural agave truly is. but it tastes good and you only need to add a small amount to get the sweetness - i would probably use 1 TB agave in this ratio. Brew 2 strong cups of coffee. In a bowl or pyrex measuring cup, whisk all the ingredients together until the raw sugar is dissolved and you have a lump-free liquid. It will help to melt the sugar and the thick coconut cream while the coffee is still hot. Pour the liquid into ice cube trays. Place in freezer and freeze until solid. I would recommend 24 hours. Add these coffee cubes to your regular cold brew or cold coffees. Be sure to follow proper iced coffee making instructions so that your cold coffee is diluted appropriately and it is not watered down in the first place. OR cut popsicle sticks in half and freeze them into the ice cube trays for little ice pops! 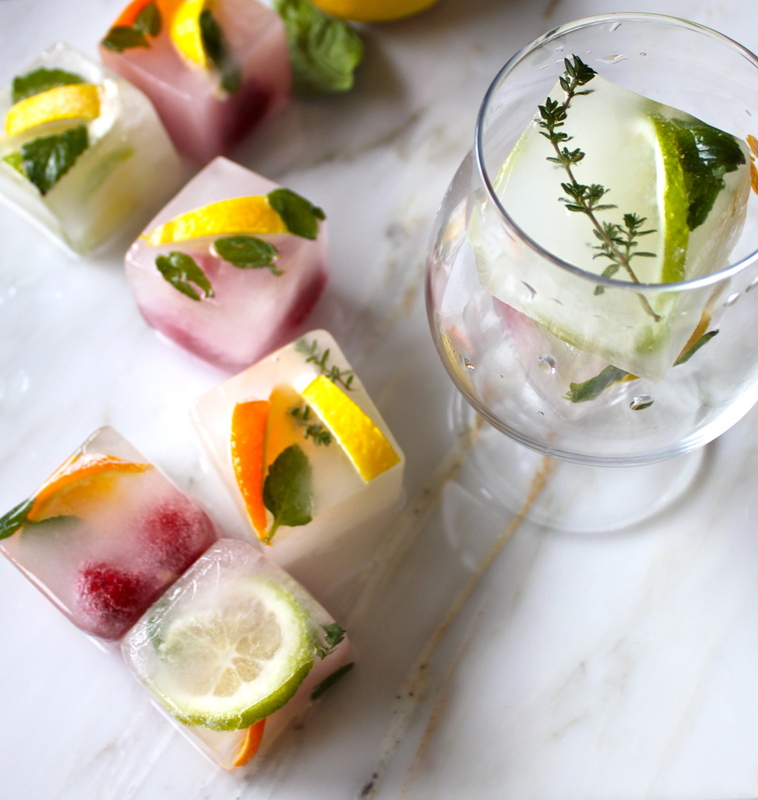 citrus & herb ice cubes. pretty ice cubes. not really a recipe to follow, just an idea for when you're looking to beautify your flat water game. my bff katie got me this ice cube mold for xmas with extra big cubes. thanks kt! mwah! i was in the mood to make something before we left for mexico, but didn't feel like going to buy anything at the store. so these fruity ice cubes were born. haha. bloggin' on a budget. just slice up any citrus fruits you may have into thin, triangular wedges or rounds. i plucked some spearmint and thyme from our front yard. for extra flair! fill the ice cube tray 3/4 full of water, then plop whichever fruits & herbs together in each compartment. i did a variety of combos. orange, lemon, mint, & thyme. i would let these freeze for at least a full day. i left for mehico and took photos of these just yesterday, so they had plenty o time to harden completely. i drank a big ol goblet of pellegrino with tooty fruity ice cubes yesterday, and it was delightful. after the cubes melt, you're left with citrusy, minty, red raspberry water! it was juicy, light, and fresh in flavor. i would also recommend making these only when you need them, instead of just always leaving them in the freezer to have on hand. the fruit starts to taste a little like freezer, which is gross. try to keep it as fresh as possible. i do declare this would be a fine addition to a valentine's day dinner. coming up next week, people! its so stupid easy, but downright pretty. another fun valentine's day/holiday table water idea is something like what i made last year. blood orange rounds with fresh rosemary sprigs. at our holiday party a couple months ago, i made blood orange & lemon water with rosemary. mostly because it looks pretty on the table, but our party people were really impressed by it. it was the talk of the table, when it was truly the simplest thing there. my friend joe said something like, "wow i feel like i'm drinking from some freshass mountain spring." haha. its supa light and fresh and will add just an extra touch of excitement to a meal or party spread. Wash the fruit thoroughly. Slice the citrus fruits into thin wheels or wedges, leaving the rind on or off, whichever you prefer. I left all the peels on. 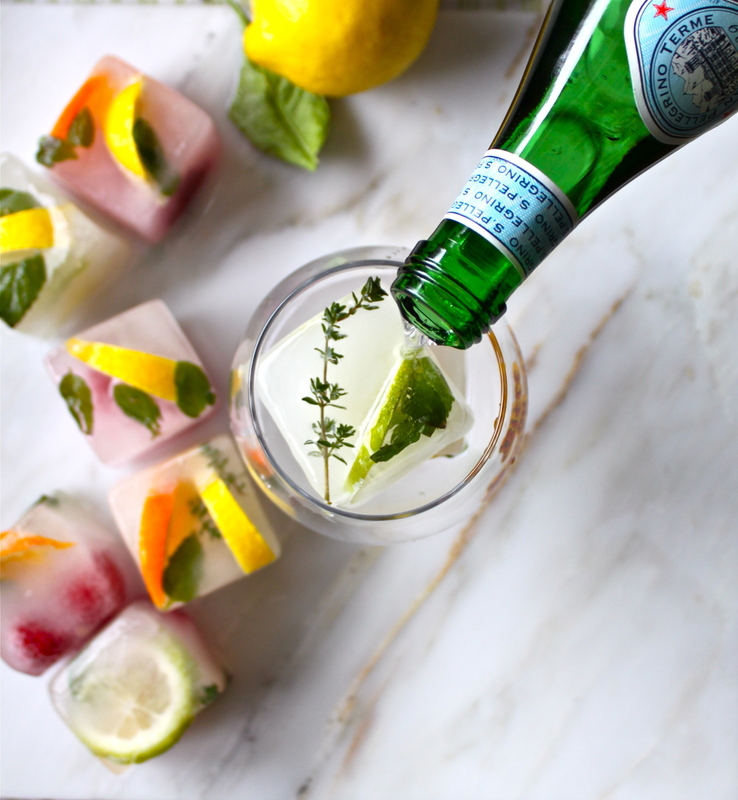 Wash all the fresh herbs and cut into small enough pieces to fit inside your ice cube tray. Fill an ice cube tray 2/3 to 3/4 full of flat water or sparkling water. Add in various citrus wedges, raspberries, and herbs. Add additional water to the top of the tray if the compartments are not quite filled to the top. Note: I used an 8-ice cube tray with about 2x2 inch square cubes. They are big cubes, so I could fit larger wedges of citrus in each compartment in comparison to a standard ice cube tray. Slice your fruits according to the ice cube tray size that you plan to use. Freeze the ice cube tray for at least 24 hours. 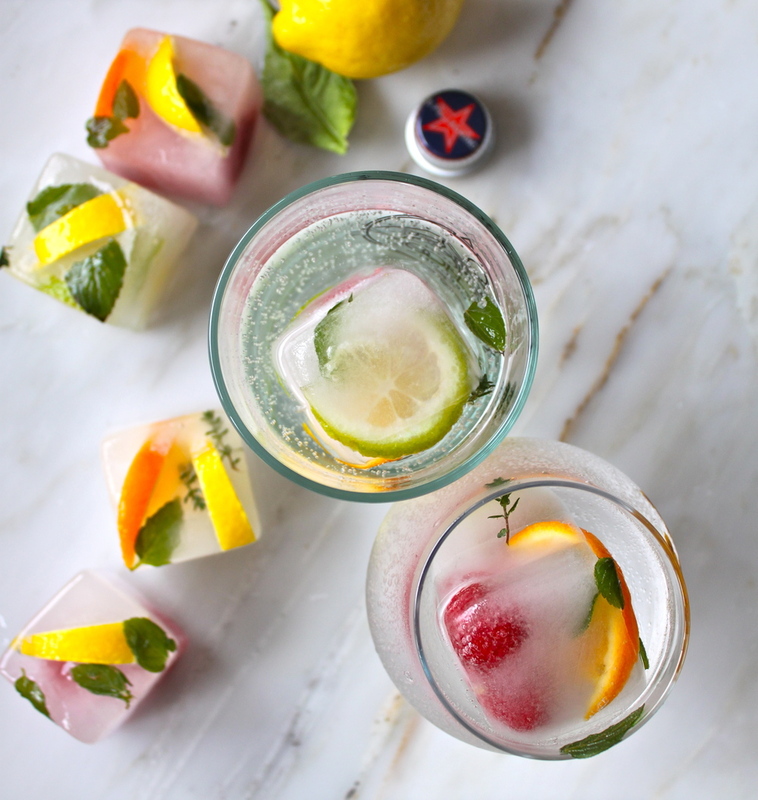 Serve a couple of ice cubes in water, white wine, or any other beverage you see fit. Enjoy!